Grizzly Claw. Rich, Dark Chocolate, Decadent. From the heart of the mountains, a strong spirit roars. This is the most magical hand mother nature can deal, and it’s headed for a mug near you. Beans are sourced from Central and South America and are certified organic, vegan and kosher. Iâ€™ve been trying all the different Kicking Horse coffees for cold brew, and this is my favourite hands down. It produces a rich, strong, smooth cold brew, with hints of chocolate. Fantastic! This is my favorite of the kicking horse brands. The coffee is bold and smooth just as I like it. Very rich and amazing coffee. Love to start the day off with a cup of this! Great coffee. So glad it's ground now, as I don't always want to grind beans. I love being able to buy Canadian coffee. This is my husband's favourite flavour from kicking horse! Highly recommended and especially when it goes on sale at Well. my husband loves this coffee. Hint of a chocolatly flavour. Dark, and bold. Good level of caffeine. Great to drink black- wonderful flavour. I love Kicking Horse coffees! They are great for iced coffees and I often use the grounds after with some coconut oil frozen into scrubs. 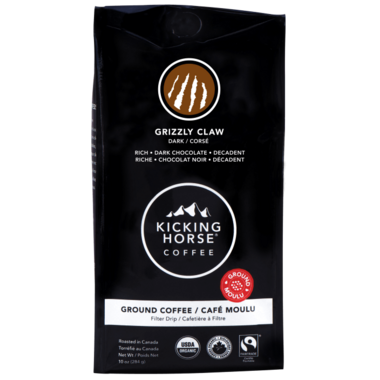 We have tried other Kicking Horse blends available at well.ca, but Grizzly Claw wins every time. Dark, rich and smooth, it's the perfect cup to start the day.